A mix of the old and new can be found on the Ohio Northern University Campus in Ada. ADA — The Village of Ada in Hardin County comes to life when school is in session at Ohio Northern University. The school was founded in 1871 and was called Northwestern Ohio Normal School. When the school added pharmacy, engineering, law and business programs, the name was changed to Ohio Normal University. 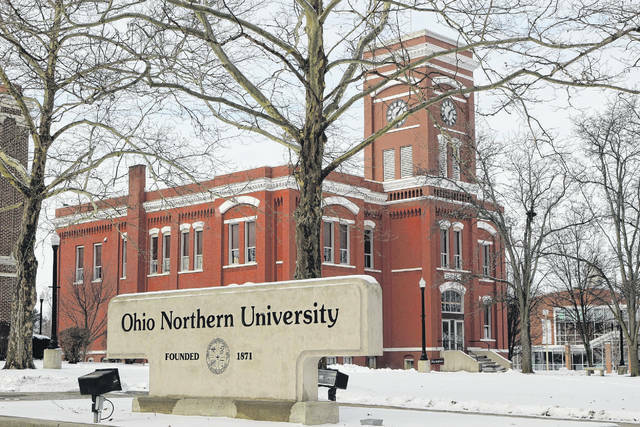 In 1903, it became Ohio Northern University. One constant at ONU is change. Buildings are built, curriculums added and enrollment grows. The university is led by President Dan DiBiasio. Construction on the new facility should begin in mid-March. Classes should begin in the fall of 2019. Because of the new building, other programs will be moving into newer spaces. “We will be able to repurpose the existing College of Engineering in the Biggs building. We will be putting our tech studies program in there. That program is currently located in Taft, which was a former gymnasium,” he said. “The Biggs building will be occupied by psychology, sociology and criminal justice in that space. So they’ll get some new and additional space for those programs as well, and we are building an information technology building that will allow all of our IT staff to be under one roof,” he said. ONU is also in the process of expanding its solar power capabilities. “Last year we connected our first solar array. It was two megawatts, and it was so successful we are currently in the process of extending it by one more megawatt,” he said. That additional solar grid should be ready by this spring. ONU already has three wind power turbines and 27 geothermal wells on campus. https://www.limaohio.com/wp-content/uploads/sites/54/2018/02/web1_SpiritONU-toned.jpgA mix of the old and new can be found on the Ohio Northern University Campus in Ada.